All-around smart? Motorola puts its Moto 360 smart watch with leather band and classic design into the smart watch race -- and, at first glance, the Moto 360 makes a good first impression. Our report will check to see if this $249 USD gadget, in everyday use, holds up to this initial impression. Michael Knight was a visionary: the hero of the 1980s Knight Rider series could call his car and hunt down criminals using an intelligent wristwatch. Nowadays, the "smart watch" is an everyday device, another personal digital assistant that allows its users to redirect notifications, retrieve information, or keep track of personal fitness — all in conjunction with a smartphone. Motorola added a smart watch — dubbed Moto 360, likely due to its circular clock-face and multiple options for usage — to its product line in the second half of 2014. We have thoroughly examined this gadget for this review, and our review asks the question: would "Knight Rider" have been envious? 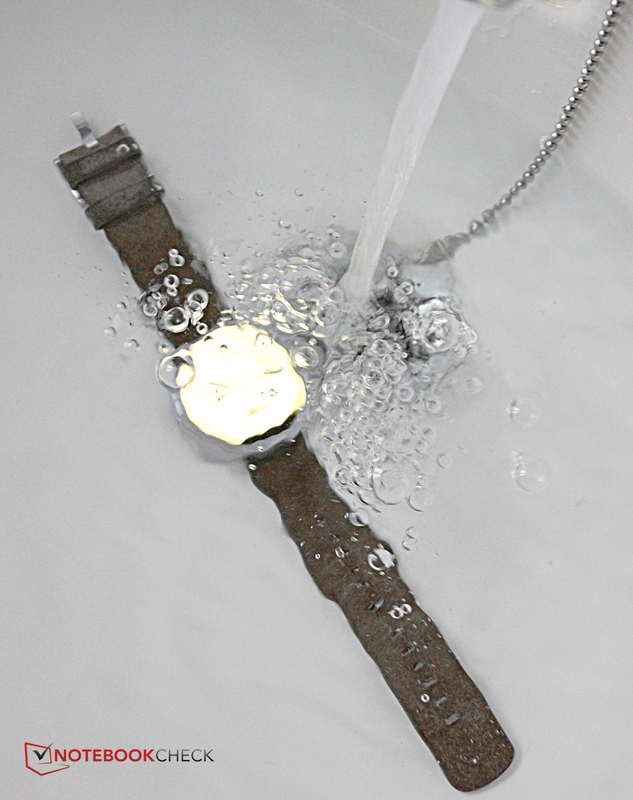 The smartwatch is water and dust resistant. The last generation of Motorola's Moto X featured quality materials that could be configured with either leather or wood. It is not surprising, therefore, that the Moto 360 sports not only a stainless steel casing but also a leather wristband (from American tannery company Horween, which also produces leather for professional footballs and basketballs). The watch’s glass is made of Gorilla Glass 3 that has been slightly honed at its edges — a quality feature that, unfortunately, leads to problems with light refraction and color fringing. Our Moto 360 test sample arrived with a brightly-colored casing and gray wristband. 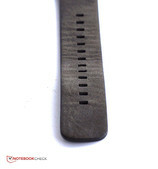 A black configuration (black casing and black leather wristband) is also available. The 360’s casing looks compact and robust, but strong pressure on the surface becomes visible in the liquid crystals of the display. 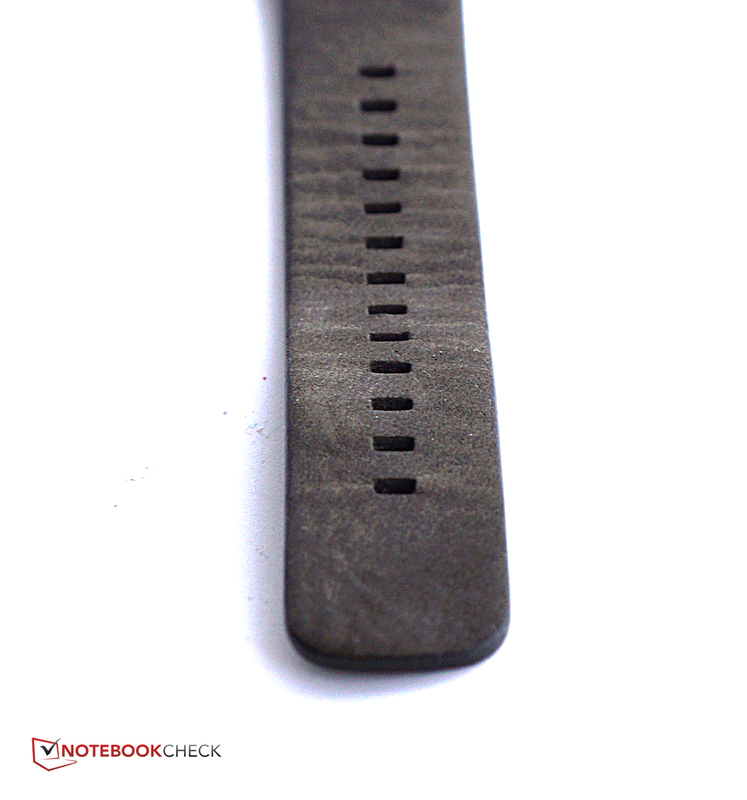 We liked the fact that the wristband has many holes for both thick and thin wrists. The wristband, however, is not easy to replace. Though the Moto 360 smart watch is, at only 49 grams, very light, it might overwhelm smaller wrists. The 46 millimeter diameter casing, with a height of more than one centimeter, creates a rather bulky watch. Motorola has created a smart watch with an IP67-compliant IP certification. This is the same protection standard as the the Samsung Galaxy S5, the current top smart phone. IP67-compliance means that the casing is totally dust-proof, and that users can dive to a depth of one meter in fresh water for at least 30 minutes while wearing the Moto 360. 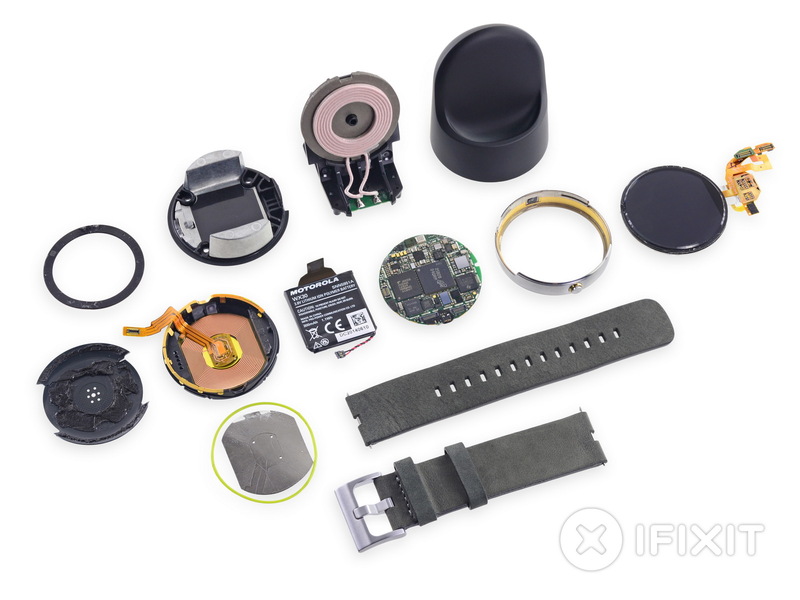 Our colleagues at iFixit tore down the Moto 360, and uncovered several problems and inconsistencies. Motorola uses a lot of glue in the 360’s construction, which would unnecessarily complicate its repair. In addition, the battery capacity is lower than stated in the tech specs. 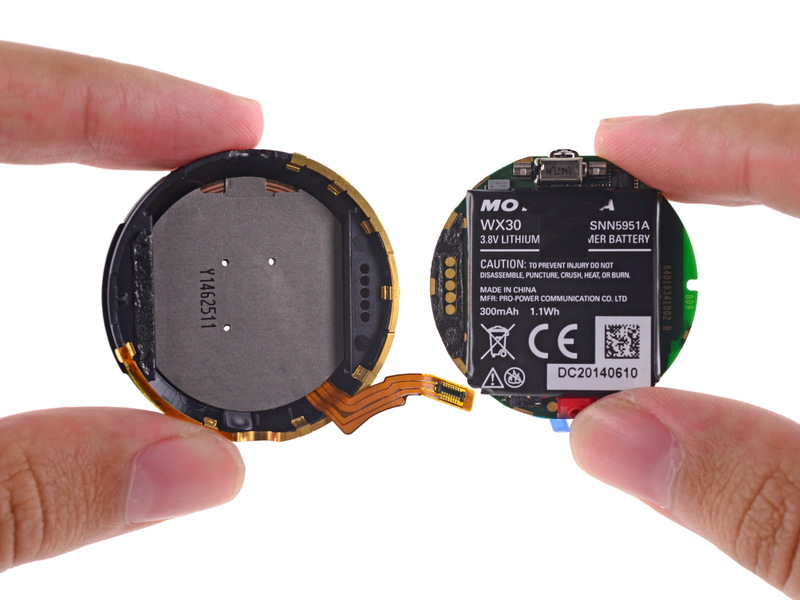 Overall, the Moto 360 smart watch scored only 3 out of 10 points in a "Repairability Score." Our verdict: the design of the Moto 360 looks very much like a conventional wristwatch, but the 11 millimeter case height makes it too bulky. The materials, however, are of good quality, and the watch is also suitable for short diving expeditions or excursions to a dusty construction site. The materials are very classy: stainless steel and genuine leather. However, the casing is quite bulky. The wristband can be adjusted to many sizes. 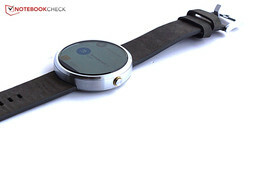 Unlike other smart watches — such as the Asus' ZenWatch or Samsung's Galaxy Gear Fit, both of which have a port for connecting with a charging cradle — Motorola has provided the Moto 360 with wireless charging via the Qi standard. The watch recharges reliably no matter where it is placed on the charging cradle, and a digital clock is faded in so that the smart watch can be used as an alarm clock on the bedside table while it is recharging. None of the other features of the smart watch, however, can be used while it is recharging. A heart rate monitor and pedometer provide the watch’s fitness functionality. The pedometer, however, does not function reliably: the counter only displayed 50 steps after a run around the block. The heart rate monitor displays a heart rate quickly, but we had the feeling that the displayed rate was often a bit too low. The Moto 360 connects via Bluetooth 4.0 to all Android smart phones equipped with version 4.3 and higher operating systems. According to Motorola, pairing with the 360 is possible with only one smart phone or one tablet at a time, and the smart watch must be reset when users wish to pair it with a different device. Our test confirmed this: though pairing with a new devices was possible, the first connection happened only after the 360’s system was completely reset. Notifications are faded in from below. 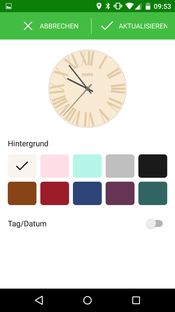 The clock-face can be selected freely. Internet search results quickly become confusing. ...changing the color of the clock-face. 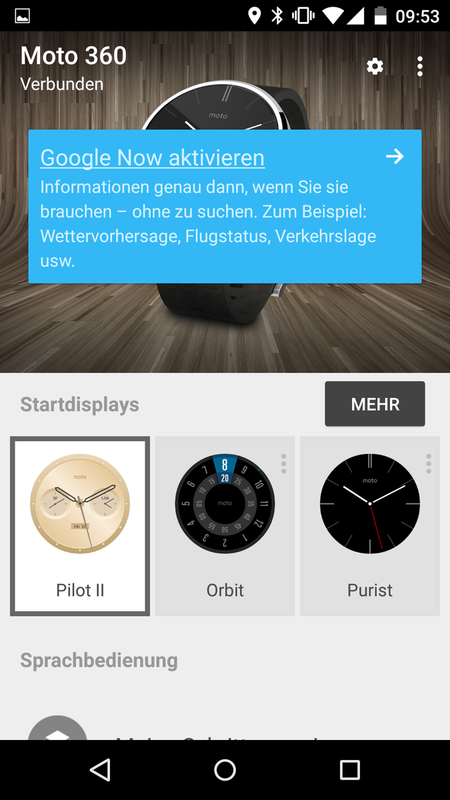 An Android Wear Companion app is alternatively available. The Moto 360’s Android Wear 4.4 is an operating system developed specifically for “wearables.” While it allows the Moto 360 to be used as a standalone device, it is a device with limited functionality: it cannot connect to the Internet without being paired with a smart phone or tablet. "Google Now" speech control comes with the 360, though it, too, also works only when connected to the Internet. While it basically understands all commands that are available on a smart phone, the smart watch version is considerably less flexible and seemed restricted to very simple commands. For example, the question: "How high is the Eiffel tower?” is answered promptly by Google Now on a smart phone; but the same question went unanswered by the smart watch version of the application. Even predefined commands were not always understood reliably in our test. Just as annoying: speech control is not available in standby; the smart watch has to be manually activated first. Touch control is a bit awkward, and cannot be consistently relied upon. A double tap on the touch screen generally opens the menu, and up and down gestures allow the user to select different options. When the smart phone goes into standby mode, however, double tapping will not return users to the last-viewed menu. Instead, the watch returns to and then displays the main menu. Consequently, users will always have to navigate back to where they were before after an interruption. Additionally, the touch screen is not always reliable. It worked best in our tests with the use of the thumb rather than the other fingers, which is a rather impractical navigation method for a device strapped to the wrist. 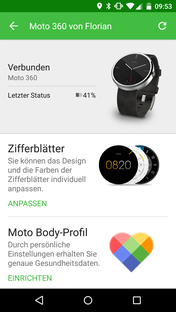 The Motorola Connect App or even the Android Wear Companion App are more user friendly. Both are easy to use, enable the setting of many features of the smart watch via the larger smart phone screen, and offer a vast range of functions. For example, it is possible to select and configure different clock-faces; time zones, colors, calendar indicators, and much more can all be customized. 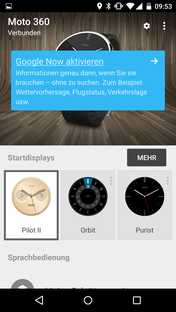 We downloaded and installed an update to Android Wear 5.0.1 during our tests. 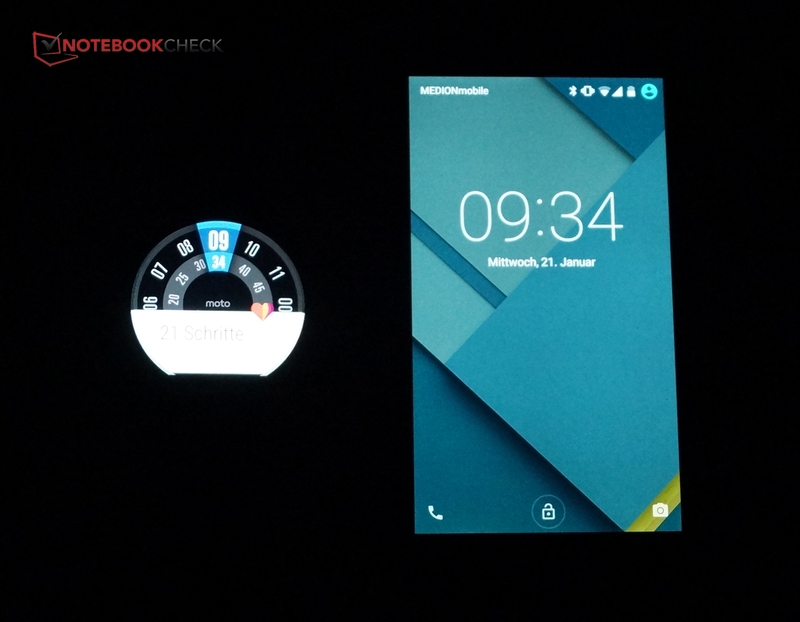 It changed the controls slightly and, in our opinion, improved the Moto 6’s usability. The menu items are separated more clearly and can be selected with greater accuracy. We recommend installing this update. A USB charger with a non-removable cord is included in the stylish round packaging of the Moto 360. The USB charger can be connected to the charging cradle and the smart watch is simply placed on top of the charger, where it then recharges wirelessly. 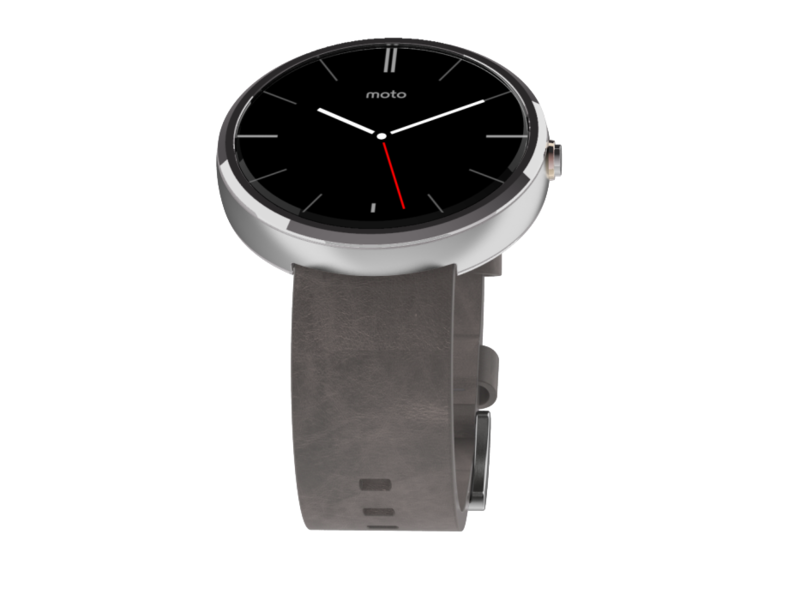 There were no other accessories for the Moto 360 available on Motorola's website. Only a 12-month warranty is provided for the 360. A 24-month retailer warranty is applicable in Germany and Austria. The circular display is actually a square cut round display. This becomes obvious via the black strip at the bottom, which cannot display any content. This is a problem when text sometimes extends beyond the circular area of the screen. Motorola specs state a screen resolution of 320 x 290 pixels with a diameter of 1.56 inches. This is a bit more than LG's G Watch, but the Asus' Zenwatch, with a square screen and320 x 320 pixels, provides slightly more room for content. 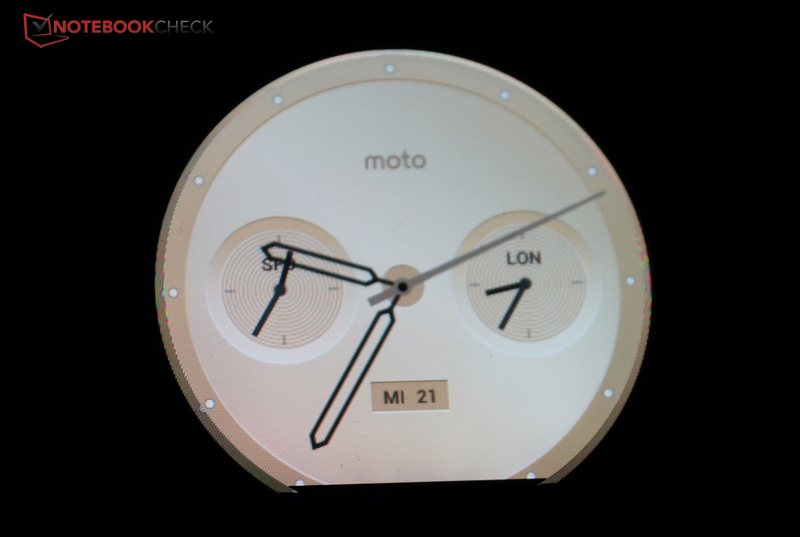 The Moto 360’s resolution is high enough for the relatively small display. The reproduction is not razor sharp when looked at closely, but it suffices for common smart watch uses. The low resolution is actually only noticeable when a picture is taken with the camera via the remote release on the Moto 360 and the Google camera app. The image looks rather pixelated when displayed on the smart watch screen. The Moto 360 — unlike the Asus' ZenWatch or Samsung's Gear Fit which offer an AMOLED screen — uses an LCD display. AMOLED screens have a high contrast ratio that increases their readability. The Moto 360, by contrast, is highly-legible outdoors only on cloudy days, and indoors only in bright environments — at least when the Moto 360’s brightness is set to maximum. 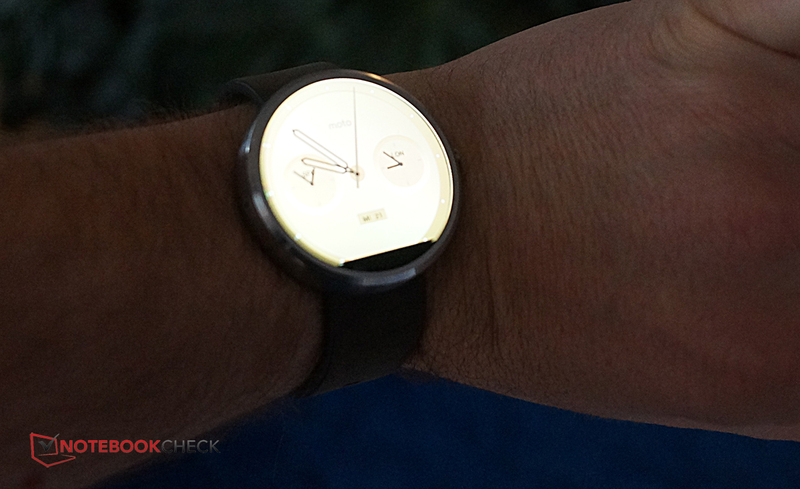 It is difficult to view anything on the Moto 360’s reflective screen in direct sunlight. The 360’s processor is no longer the newest model: its OMAP 3630 from Texas Instruments clocks at only 1 GHz, and is already four years old. When compared to the Snapdragon 400 SoCs that are, for example, found in Asus ZenWatch or LG G Watch, a slight recurrent lag is noticeable when using the Moto 360. Wireless charging of the Moto 360 is quite fast: the battery is completely recharged in about 1 1/2 hours. However, the lithium polymer battery is not particularly big: its 1.1 watt hours and 300 milliampere hours are considerably less than that of Asus' ZenWatch, which has an approximately 20% higher battery capacity. The 360’s battery capacity dropped from 85% to 55% after four hours of intensive testing. This would result in a run time of approximately 13 to 14 hours of intensive use, which was our experience in our overall test usage of the Moto 360. A whole day of mixed use is quite possible. The smart watch could even last for three days when only the time is displayed — but that would be a significant under-utilization of the gadget. In review: Motorola Moto 360, courtesy of Motorola Germany. 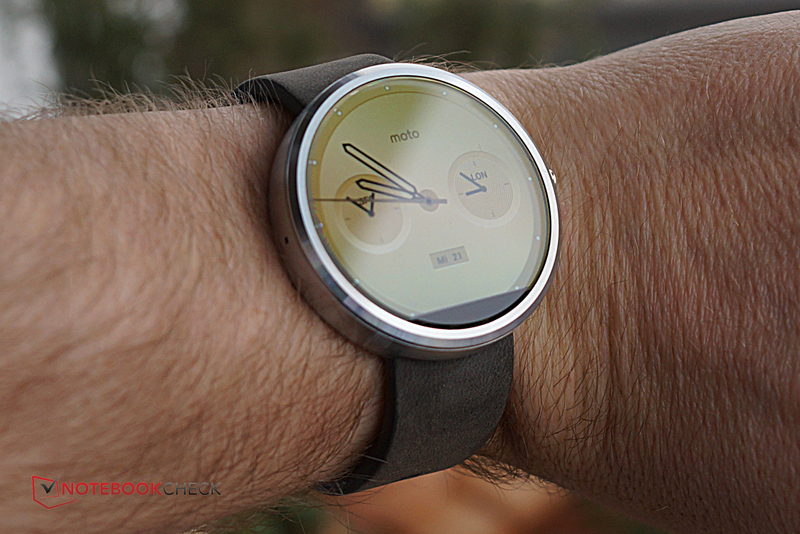 The Moto 360 is Motorola’s rather stylish entry into the smart watch market,. 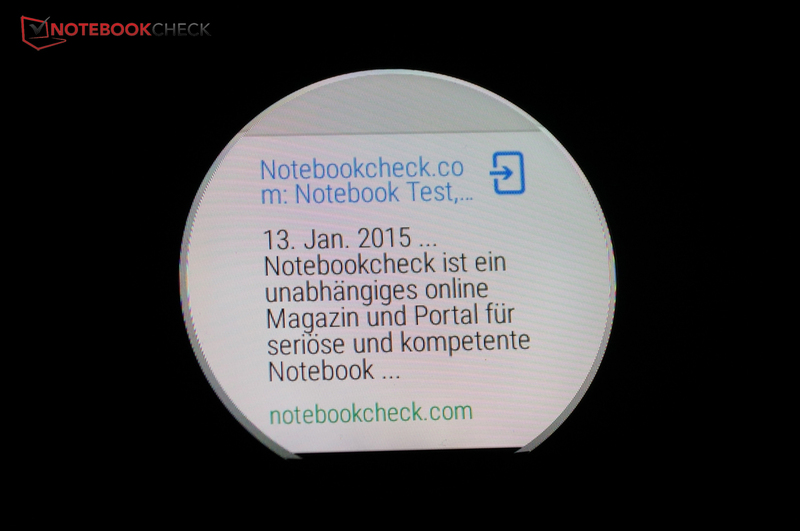 The materials are of good quality, and the circular display is a nice change from the earlier square smart watches. Users should definitely update to Android Wear 5.0.1 because it significantly improves the phone’s usability. 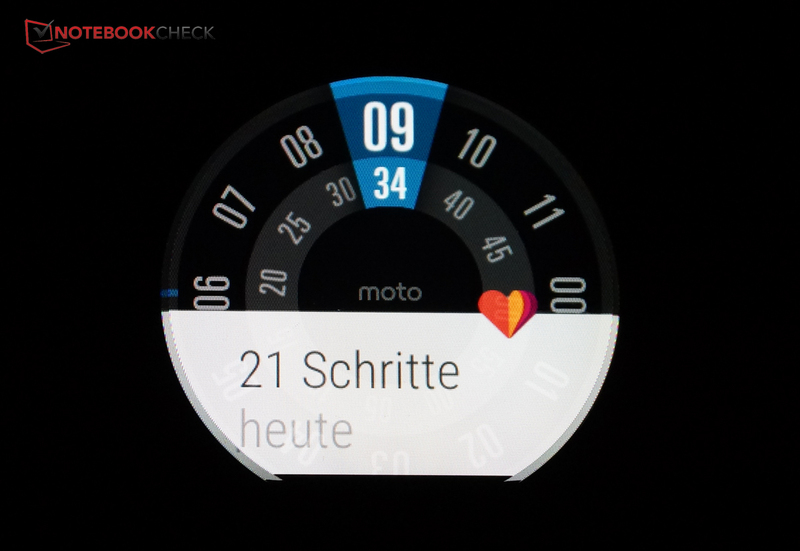 The companion apps from either Motorola or Google also make it easier to configure the smart watch. Wireless charging and water and dust resistance are additional features. What we did not like about the Moto 360 was its rather thick casing that makes the smart watch ungainly and hard to use on smaller wrists. The honed glass produces color fringes and image shifts at the edge, and the black bar on the display's lower edge (which fills the unused space of the circular display) is unsightly. Sometimes text is unreadable because it extends beyond the limits of the circular display. Usage of the device is a bit inaccurate, the processor is not the fastest, speech detection is occasionally unsatisfactory, and the pedometer and heart rate monitor are not very precise. The overall impression that the Moto 360 makes is not a great one, especially in light of its steep $249 USD price. The quality materials and the "Knight Rider coolness factor" will, for the ambitious user, outweigh these limitations. All other users should might want to wait for the next generation of smart watches. 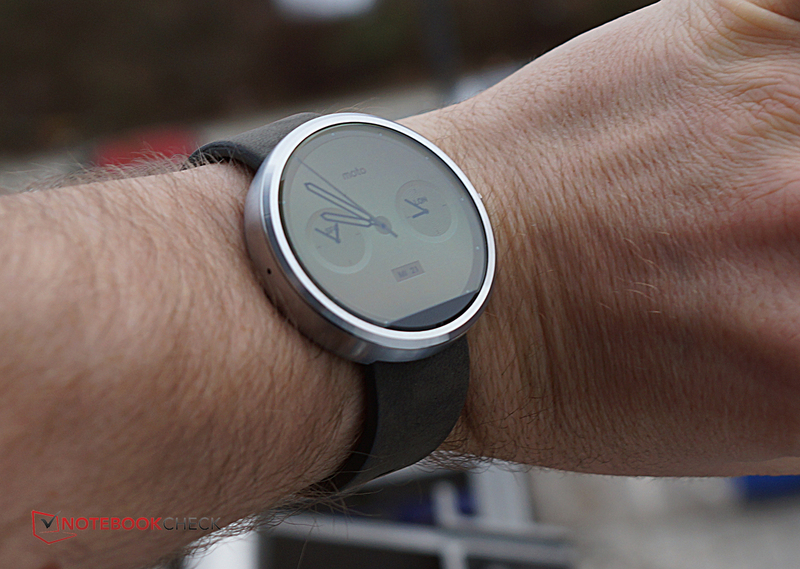 In Review: Motorola Moto 360. Test model courtesy of Motorola Germany. A completely circular display that does not cut off images/text. Just how unrefined some things about the smart watch seem, even though it costs as much as an inexpensive mid-range smart phone.